Whether you believe in astrology or not, there’s no denying that it can be difficult to avoid if you’re an avid reader of women’s magazines, or even the local newspaper. There’ll always be that little section, just towards the middle or back of the publication, telling you what the day or month is likely to bring, according to the alignment of the planets and other astrological vibes. Some people plan their days around their horoscopes, and avoid doing certain activities if there is a prediction that something bad could occur as a result. Some say that they’re rubbish, but will still read them, just to see if the forecast is accurate by the end of the day. Others completely ignore them, and go about their business without worrying about potential zodiac consequences. Regardless of your beliefs, it’s very likely that you know what your star sign is, or at least what the name of your star sign represents. We’ve grown up in a quietly superstitious society, where information such as star sign representations are ingrained in our minds, even if we haven’t been fully exposed to them like some cultures may have. 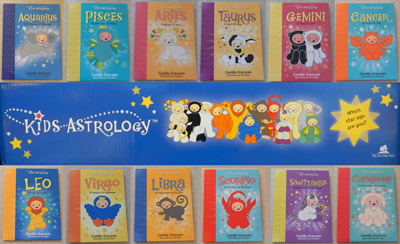 That could be why the following astrology books have been released specially for children- so that they can learn about the different signs, what they represent, and how they ‘affect’ their day-to-day lives. There is one for each of the twelve star signs, and each feature a cute character that children (and adults) will adore. These Astrology Kids tell you all the character traits that they possess, both good and bad, that are indicative of their star sign. They are never completely negative in their explanations though- for example, Aries kids can be bossy, but they make sure that things get done! The illustrations, done by Thea Baker, are colourful and charming, and children will love identifying with the character that represents them. Towards the end of each book is a little section that lists each Astrology Kid’s symbol, ruling planet, element, gemstone, flower and colour, which should keep die-hard astrologists happy with the content that is being delivered to their children. The rest of the star signs are also mentioned at the back of each book, so that children can check whether the signs of their family and friends are accurate. These simple little books are a good introduction for children who may be interested in learning about their horoscopes, and the character traits that they supposedly embody by being a particular sign. At $5.95 each, they’re also very affordable, so you could easily buy one, a few or the whole set.